As we come together for worship, it is our desire to give glory, honor and praise to the One we’ve come to worship. He is our loving Creator, Savior and Redeemer and He alone is worthy. As we express our love and thankfulness to God for all that he has done and is yet to do, we invite you to join with us to share in a time of song, prayer, communion, fellowship, and hearing the Word. The OCC Worship Team is a group of volunteers who have a passion for serving God and others through music. Each one brings their individual gifts and talents to lead the people in a time of praise and worship to the glory of God our Father. Our blended worship service combines treasured hymns of the past along with the best of today’s contemporary praise and worship music. Our lead worshipers are skilled vocalists who have a desire to help others draw near to God in a genuine time of worship. Our band consists of trained musicians who also desire to serve God with their talents. 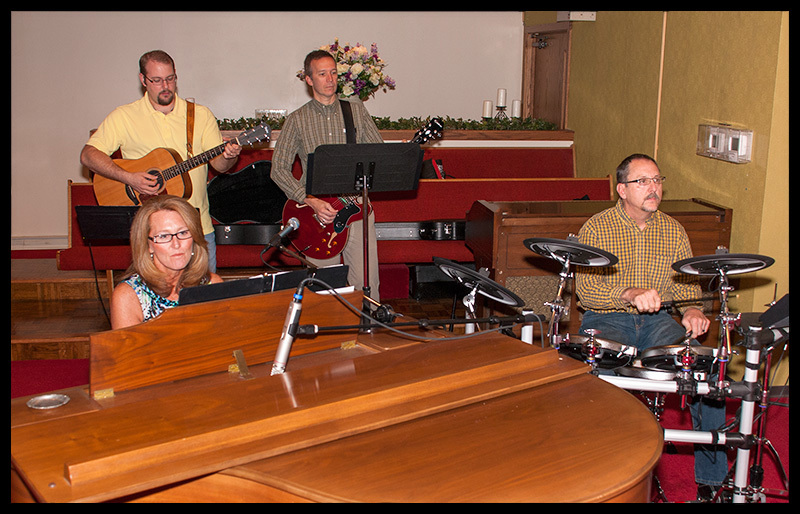 On most Sundays, we use piano, guitars (acoustic, electric, bass), and drums to lead our worship service. This ‘behind the scenes’ ministry is not for everyone. We appreciate our media and sound members and the commitment of time they give to the Worship Team. Their skills in computer, video, media and sound make them an invaluable tool for our services.